Mr. Mayor reckons the chair is much more comfortable than it looks; Igor (pictured sitting) certainly seems happy. Regardless of Igor’s comfort, the chair is a great illustration of what we mean by a double integral. Those of you who are not familiar with calculus–or who never felt comfortable with it– please read on! This is meant for you! Integral calculus is an amazing machine that enables us to compute areas — or volumes, if we’re in 3 dimensions– of objects of various shapes. Let’s use this view of the chair as an example. Suppose we want to find the area inside the purple curve below. We will ignore the rest of the chair for now. The most natural way to get an approximation of this area would be to find the areas of the thin rectangles inside it (let us assume that there are no gaps between them, as there are in the above picture). The better approximation we need, the thinner the rectangles and the more of them. The miraculous part of calculus is that the seemingly endless process of increasing the number of rectangles and decreasing their thickness is actually not endless at all. Assuming the curve is not too wacky, the process results in the true area under the curve. And this is what is known as a definite integral. Here’s where Mr. Mayor’s chair is uniquely positioned to help. Suppose we want to find the volume of the chair. Again, let’s assume that the rods are right up next to each other, with no gaps between them. So our task is to find the volume of every rod. That’s something we can easily do without calculus. To keep organized, we could start out with the volume of the first row of rods in Figure 3 (above), and continue, row by row, toward the back of the chair. But what do we do if the chair is upholstered, and we want the exact volume under the pink upholstery? Just as before, calculus gives us the machinery to find the answer by increasing the number of rods as we make them thinner and thinner. With this fancy machinery, we can still keep our row-by-row scheme (we can also choose rows that go from the front of the chair to the back). And this is what is known as a double integral! 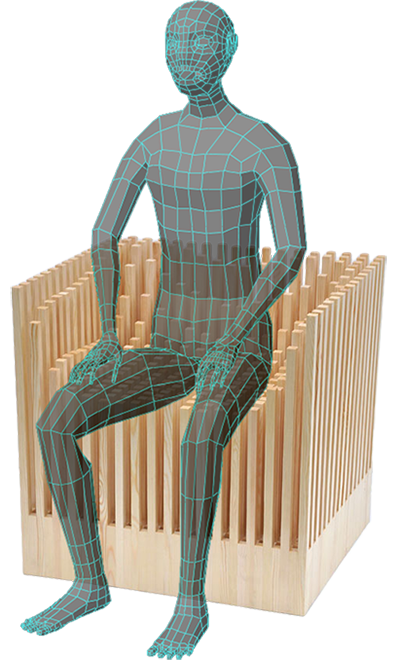 Special thanks to designer Julian Mayor for permission to use pictures of his design, and to 3D modeler Pratik Parija for drawing Igor sitting in the chair, as well as the “upholstery”.